Due to the break-neck pace at which most of us live life, the most important meal of the day seems to be the most neglected. When we cheat the breaking of the fast, we then often make poor choices for mid-morning snacks or lunch because we are so famished. Try these make ahead and simple solutions for your morning rush. Charging up with slow-release, whole-grain proteins keeps me from getting “mid-morning hangries” and carries me through to making wise selections for a proper lunch. This lovely mixed-grain morning cereal with Ukrainian roots is my absolute favorite. It is easily made ahead and reheated quickly by putting about 1/2 cup water under the grains in the bottom of the pot, then steaming on high for 3-5 minutes. The recipe is adapted from Pure Vegan by Joseph Shuldiner. I often put the grains and water in covered pots overnight to soak. This step makes them more easily digested and cuts the cooking time a bit. 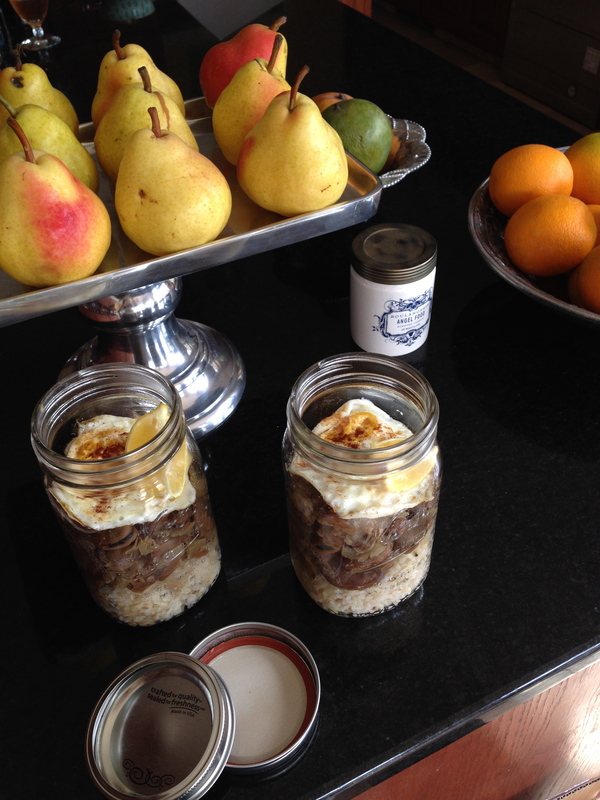 I love the way it looks in pint-sized Mason jars for a very portable breakfast. Get ready, get set, go! If not soaking the grains, bring 1 1/2 cups water to boil in a small saucepan and add the farro. Turn down the heat to simmer, cover and cook 25-30 minutes, or until water is absorbed. (If you are using the soaking method, just bring the pot to a boil, then lower to a simmer, cooking for just a few minutes less). Simultaneously bring 3 cups of water to boil in a large saucepan. Add the other grains, turn down the heat to simmer and cover. Cook for 15-20 minutes or until water is absorbed. Let stand covered to steam while the farro finishes cooking. (If you are using the soaking method, just bring the pot to a boil, then lower to a simmer, cooking for just a few minutes less). Add the farro to the larger pot and fluff lightly to combine all the grains. Serve into bowls and top each with the cherries, almonds, agave/maple syrup, chocolate and cinnamon. Pour almond milk over it all. Place the almonds, water and cinnamon stick in a blender. Soaking for a few hours will extract more flavor and nutrients from the nuts, but I have made a yummy quick version of this nut milk without the soaking. Blend the nut mixture until smooth and creamy. Pour it all through a nut milk bag or fine mesh strainer over a big bowl. Stir in the agave or maple syrup. Refrigerate. Drain and rinse the beans. Place them in a large pot, covering with 4 inches of water. Bring to a boil over high heat. Reduce the heat to medium and cook until the beans are tender, about 1 1/2-2 hours. Meanwhile, saute the onion in a bit of water or vegetable broth until tender and beginning to brown. Add the garlic, cumin, cayenne, lemon zest and juice. Cook 5 minutes longer, adding water by the tablespoon if needed. Set aside until the beans are done. When the beans are finished, drain all but 1 cup of the liquid and add the onion mixture. Mix well. Portion over prepared brown rice. Top with the parsley, salt, pepper and paprika. Serve with lemon wedges on the side. Because of its simplicity and speed of preparation, this is our breakfast of choice at least three days each week with different toppings for variety. Mason jars. Again. Soak the oats in the water overnight in a covered pot. In the morning, bring to a boil. Uncover and reduce to medium low for 15-20 minutes (depending upon how chewy you like your oats). Portion it out in bowls and serve with a nice combination of fruit, nuts, natural sweetener and spices. More About Salads… The Life of the Party! Life gets busy. But it’s exactly those times when we need to watch our eating habits more carefully. I think a gorgeous salad brings a lot of life to any table with an array of colors and textures. A well-constructed salad can breathe new life into your daily diet and also be the life of any party. When we’re on the run, we want something easy without too much prep time or forethought. I have two secret weapons for such times. (1) Beautifully flavored vinegars… For quick weekday sides. No need for oil since the flavors are so complex and rich. They can be poured into a miniature spray bottle and tucked in a purse, backpack or glove box for eating out since they need no refrigeration and have a lengthy shelf-life. (2) Layered salads served as a main dish or to take to a party… They have a variety of flavors going on and are hearty enough that they will not leave you hungry at the next pot-luck or church social. 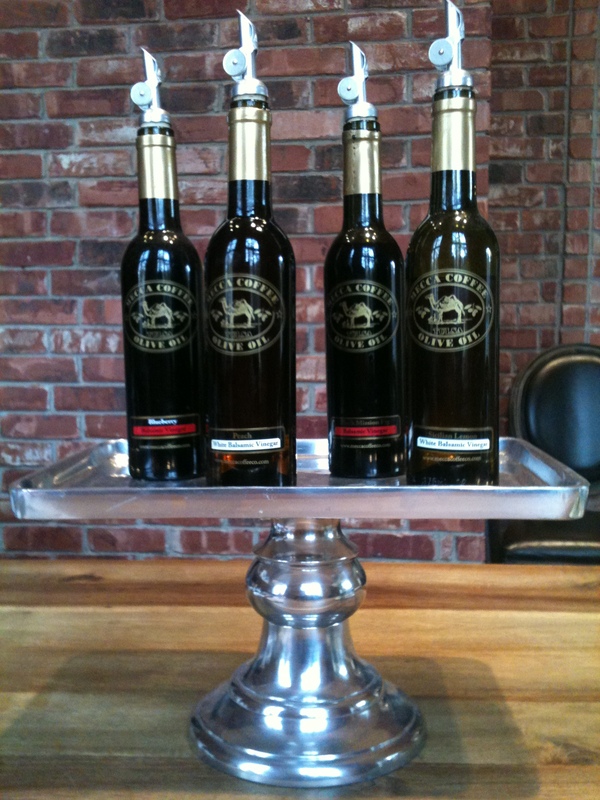 Mecca Coffee Company… The source for highest quality vinegars. When I think about vinegars, I am transported to Mecca Coffee Company in Tulsa, Oklahoma. This foodie and kitchen gadget haven is a lovely multi-sensory experience! My dear friend, Kayla DeMoss, clued me in to this beautiful shop through a generous present of several of these highest quality vinegars. Later, with one of my daughters, I went to purchase replacements for the gifted ones we used up and had the delight of sampling several more! We literally drank mini-shots and relished all the sweet and savory options! Finally, with some degree of restraint, we narrowed the choices down to six. Try Spinach, Plums, Mint, Sicilian Lemon White Vinegar, Sea Salt and Pepper. Or how about Mache, Blueberries, Toasted Pecans, and Black Mission Fig Balsamic? We also like Romaine, Honeycrisp Apple, Carrot, Toasted Walnuts, Peach White Balsamic or Blueberry Balsamic. 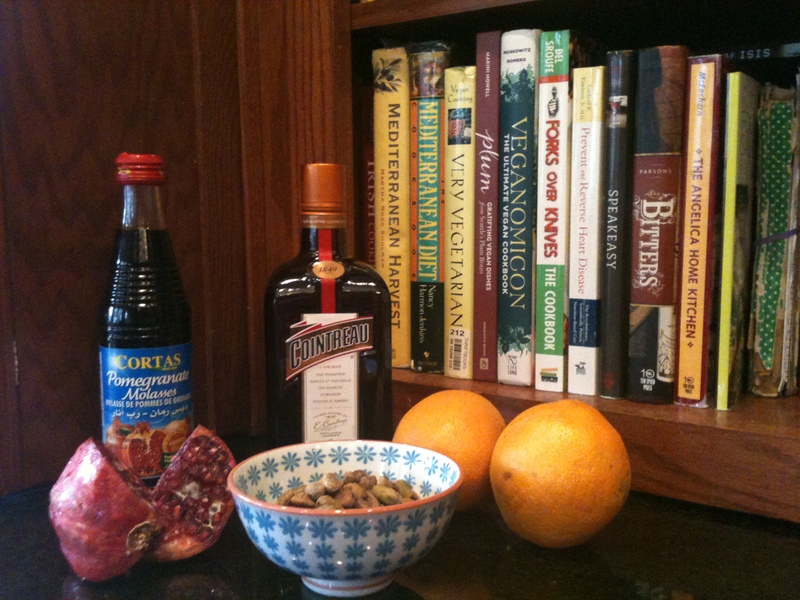 Key ingredients for Moroccan Orange Salad. This delectable addition to our repertoire is an adaptation from one of my favorite cookbooks, Pure Vegan, by Joseph Shuldiner. This book is NOT E-Safe or Engine2-Safe. I make very few adjustments to bring these luscious recipes into compliance. Mix the first three ingredients. It will be much more than you need for one salad. Prepare the oranges and layer on a platter with greens in the center. Sprinkle the dates, pomegranate seeds, mint and nuts over the top of everything. Drizzle dressing in a thin stream over all. You can also mix all the ingredients together without the greens for a refreshing fruit salad. I do not mix in the nuts, but toss them over the top where they will not get soggy. Alternately, you can again, forego the greens, delay the pistachios and pour dressing over all the other ingredients… Use instead of syrup for pancakes or waffles. Sprinkle the nuts on top of this one too. 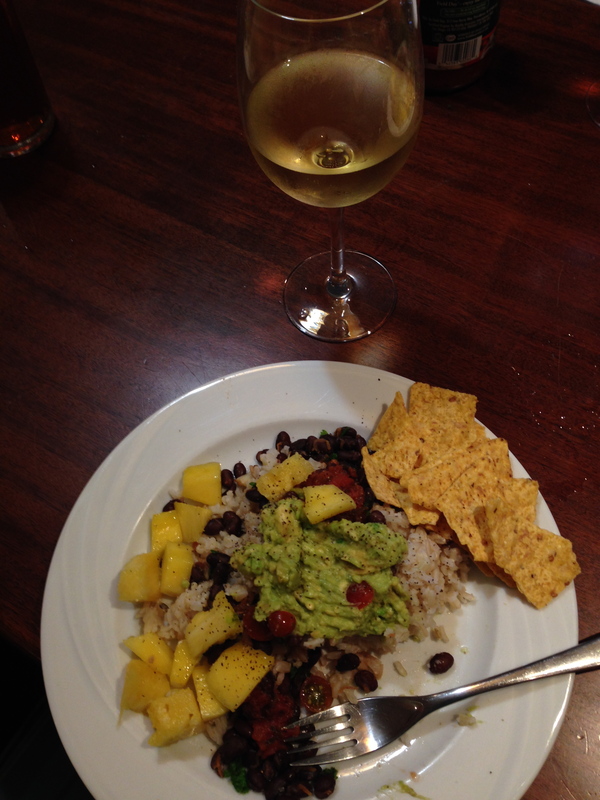 This is another jewel from Kayla DeMoss and is a welcomed dish in the bi-weekly rotation… And, my kids are always excited to see this one coming off the stove! A great intro for those new to the vegan, non-fat scene. We like black beans best when they have been soaked overnight to their full plumpness, simmered for a few hours in vegetable broth, then get an addition at the last minute of two “secret ingredients”. (Hint: One is French, the other Eastern Indian/Middle Eastern). But sometimes I don’t have my act together and instead use an organic, canned black bean. Nevertheless, this quick weekday standard doesn’t get cheated, but instead gets fullness of flavor since we do utilize our last two little magic tricks! 1 jar fire roasted salsa, for topping. Place all ingredients in the blender, pulse until you get a thick sauce consistency and allow to marinade until the beans are finished. You will have 1/2 cup left to freeze and use next time you cook this dish! When the beans are cooked and have very little water remaining, stir in the Lillet Blanc and the cilantro chutney. Heat gently to warm through. Simmer for a few minutes to let the flavors meld. Layer the ingredients on individual plates (or soup bowls) and serve the warm tortillas on the side. Note: This is a wonderful dish to introduce people to the non-fat, vegan lifestyle. It is hearty, comforting and filling. Plus, if you are feeding people who feel they have to eat meat, you can prepare grilled meat to serve alongside. Vegan, non-fat desserts have been the greatest challenge for us, both in flavor and texture. We’re still working on this aspect of our diet, but these are two favorites we feel we’ve almost perfected. Though we eat these sweet treats with restraint, we can feel good about our occasional indulgences… because they are faithful to our dairy and fat-free lifestyle! This super light, richly flavored, and moist cupcake recipe is from one of our favorite resources… the Forks Over Knives Cookbook. This book has so many wonderful recipes that we use it several times per week. I highly recommend it. Additionally, every person committed to or considering this lifestyle should watch the Forks Over Knives documentary! It is available on dvd and on Netflix. 1. 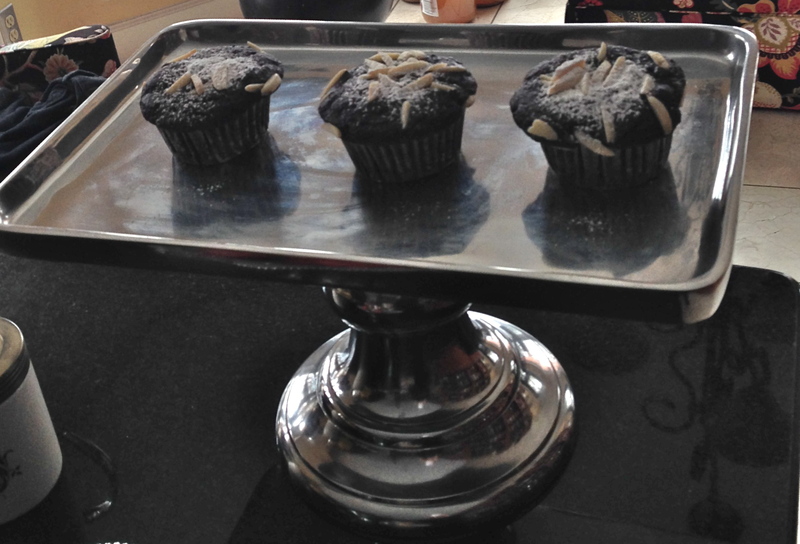 Preheat the oven to 350 F. Prepare a muffin tin with parchment liners. 2. Melt the chocolate over low heat. While the chocolate melts, mix the milk and vinegar in a large bowl and set aside to curdle. 3. Stir in the dry sweetener, applesauce, vanilla and the melted chocolate. 4. Sift together the flour, cocoa, baking soda, baking powder and salt. Add to the wet mixture, adding half at a time, beating until no lumps remain. 5. Scoop the batter into the muffin pan, filling each cup 3/4 full. Top with sliced or slivered almonds, if desired. Bake 20 minutes, or until a toothpick inserted into the center comes out clean. We like to serve these little gems with a sprinkling of confectioner’s sugar and fresh berries! This is my version of a sentimental cake made and served with love by Grandma Ruby Propst to my husband’s family, and originating with her mother, Ida Farris. This is a warming spice cake with sweet chunks of baked apple, perfect with a steaming cup of tea! Preheat oven to 350F. Prepare 9×12 cake pan with baking parchment or cooking spray. Blend all ingredients except apple, adding it when the batter is smooth. Pour into the pan and bake 45-60 minutes. Mix until smooth and pour over cake. Slice into squares and serve. With 50 pounds lost between the two of us, Jim and I feel better than ever. 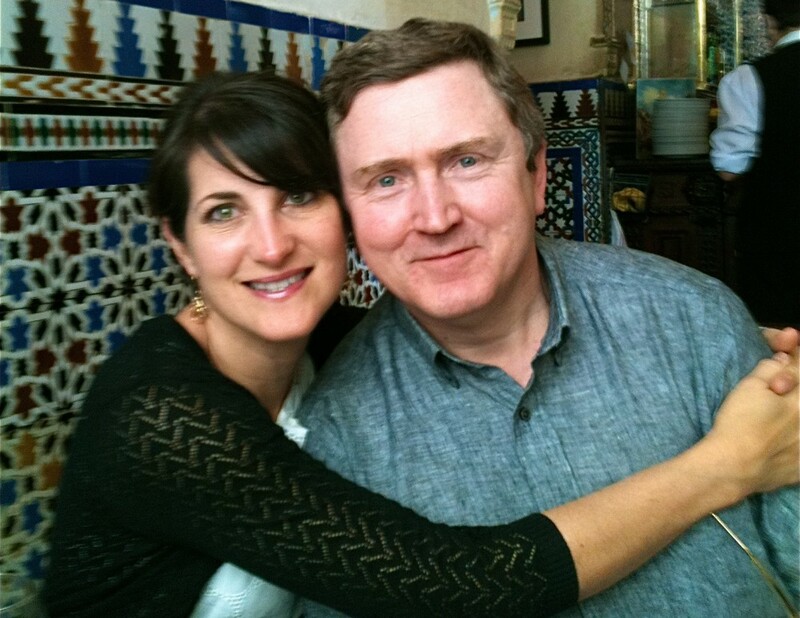 Last Fall, Thanksgiving weekend, we made a decision to try a nutritional plan which would prove to bring us renewed health and amazing energy. When I look back at the photos posted on this blog at the time of its creation, I am shocked at the difference in just our faces! We are so thankful to those who’ve chosen to join us in this quiet revolution. Gratefulness abounds toward Duncan Regional Hospital for their support and for their creation of the ReFresh Line in the dining room. The journey is made so much more fun and enjoyable by the company of all our friends, patients and colleagues! One more exciting event occurred this Fall… Jim was awarded a Spirit of Advancing Wellness Award by the Oklahoma Hospital Association. That same day we traveled with two Halliburtons, containing 18 pair of pants, to Mo at The Ambassador Shop… For alterations! My eldest daughter, Kate created this preparation for stuffed baked potatoes. Because she is a creative and intuitive cook, she often serves up delicious food with no traditional measurements. Be adventurous with this one. Change up the vegetables. Try a Yukon Gold Potato. Here’s the approximation of our delightful meal which we served to 11 hungry people. 1 sweet onion, 11 Baking Potatoes, 3 young zucchini, 3 young yellow squash, 24 cremini mushrooms, 1 bag of frozen sweet baby peas, 1/2 cup of white wine, 1/2 tsp. Paprika, 1 tsp. Lemon Pepper Seasoning, and 1 tsp. Garlic Salt. Preheat the oven to 400 degrees. Line a baking sheet and a small ovenproof dish with parchment. Peel and slice the onion in half crosswise. Place in the ovenproof dish cut side up and sprinkle with balsamic vinegar. (You can find more details for this step in Preventing and Reversing Heart Disease). Wash the baking potatoes, prick with a knife and sprinkle with sea salt. Bake the potatoes and the onion for about one and a half to two hours. Toward the end of the baking process, saute thinly sliced zucchini, yellow squash, and mushrooms in the white wine, add the peas and stir for 2 minutes. Sprinkle the spices and stir. Split the potatoes and heap on the vegetables. Top with fresh snipped chives. I have a brilliant friend, Nancy Jones. The high school kids she hosts for lunch have dubbed her, “The Magician in the Kitchen”! She spent some of her formative years in Spain and Brasil. So, of course, when she decided to take up this new eating plan, she had to recreate PAELLA! We are all so very glad she did… And you will be too! Follow any reliable Paella recipe, substituting vegetable broth for the oil. The technique of creating sucharat… that crunchy, seared, almost burnt rice at the bottom of the pan… can be tricky when you begin. Just watch that step very closely and have fun! While not the traditional Italian pasta sauce, this version has intense flavor without the traditonal fat. It’s one of our favorite weekday meals and makes enough to feed 12 people. You can also divide it into ziploc style bags and freeze it for later use. 1 sweet onion, finely chopped. 1/2 cup vegetable broth. 4 cloves pressed garlic. 4 -24 ounce cans roma tomatoes, blended. 1 tbsp each of fresh oregano, thyme and black pepper. Zest of 1 lemon. 2 tbsp each balsamic vinegar and honey. 3 splashes cabernet sauvingnon, plus more for mushrooms. 24 cremini mushrooms, sliced. Grab a large soup pot, dutch oven sized. Saute the onion until translucent in the broth and add garlic, stirring until fragrant. Add the tomatoes, spices, zest, vinegar, honey and wine. Bring to a boil and reduce heat to medium. Cook for 25 minutes, stirring occasionally. Saute mushrooms in more cabernet. Make a whole grain pasta to be topped with the sauce. Pile on mushrooms. Serve with a salad, steamed broccoli or asparagus. That Mysterious Pot on the Back of the Stove. It has a formidable presence even when it’s empty. It takes on a life of its’ own when full. The Mysterious Pot on the Back of the Stove. The Pot holds approximately 3 gallons. Since November, it is almost always rolling away, consistently churning out the richest, most luscious 4-day vegetable broth. Learning to saute and to cook rice, lentils and beans with vegetable broth has been crucial in our success in this new lifestyle. Since this plant strong nutrition plan eliminates oils, I had to find a new ways to prepare foods that my family would not just tolerate, but truly enjoy. This method is so simple and is so healthful, boosting the flavor and the nutritive level on all our dishes. Simply substitute it when you would normally measure out water for rice, lentils and beans. If you are yearning for sautéed anything, use the broth and let it reduce all the way down as you cook. Your vegetables will then begin to get that crispy, seared quality similar to what you would have achieved from the oil you used to employ. Dump a variety of fresh vegetables and herbs into Your Pot. Fill it with water. Bring it to a rolling boil, then turn it down to a nice energetic simmer. I leave it going day and night for 4 days (I turn it very low at night). Add water each night and each morning. After Day One you can ladle right from the pot during the process. It gets richer with each passing day. Strain the broth and refrigerate. I like it in old wine or mineral water bottles. The proportion seems right for most of our needs. Duncan Regional Hospital Foundation recently hosted our annual Ladies’ Luncheon, which raises funds for the Foundation. This worthy cause provides mammograms for women who otherwise are unable to afford one, nursing scholarships, and very expensive medical equipment, such as infant warmers or diabetes monitors, for our community. Each year a celebrity speaker is featured at the luncheon. It is an entertaining time for all and so much good is done by the women who support this cause by their purchase of tickets and their attendance. We are so grateful for citizens who give and band together to accomplish high goals. What does this have to do with Our Little Revolution? Rip Esselstyn was informed of the plant based nutrition movement in Duncan. He was so pleased with what is happening here, especially with DRH and many local physicians supporting it, that he agreed to come! He worked us in between other conferences in Hawaii, OKC Whole Foods and an event in Tucson! More than 300 women were treated to a non-fat, vegan lunch and heard our Plant Strong Message! They learned that even if they partially follow these lifestyle principles, they will be improving their health. Drawings were held to award prizes offered by local physicians and medical organizations who helped host the event. DRH Foundation also hosted a free public screening of Forks Over Knives that night, with Rip staying very late to do a Q and A session! Local grocery stores… Homeland, Goodners, and OKC Whole Foods hosted food baskets and gift cards. We also had drawings for VAP Profiles, a detailed cholesterol test. 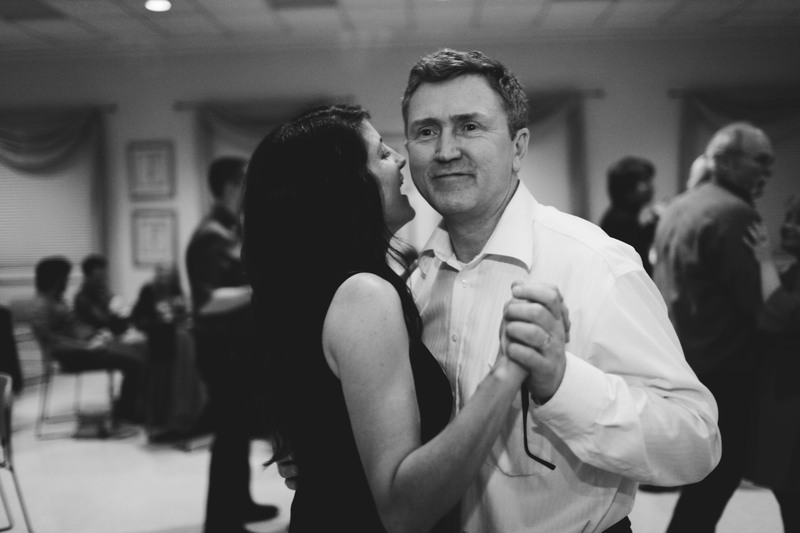 My husband looked at the crowd that evening and was delighted to see many other physicians and several of his patients in attendance. These events have propelled the 100,000 Pounds Revolution to a new level. It is growing again. And I see a firmer rooting of community among people who are adopting this new lifestyle. In supporting one another, we are seeing a renewed commitment and joy taken in the good steps we have made to take back our health. My profound thanks to all who helped make this amazing event happen!